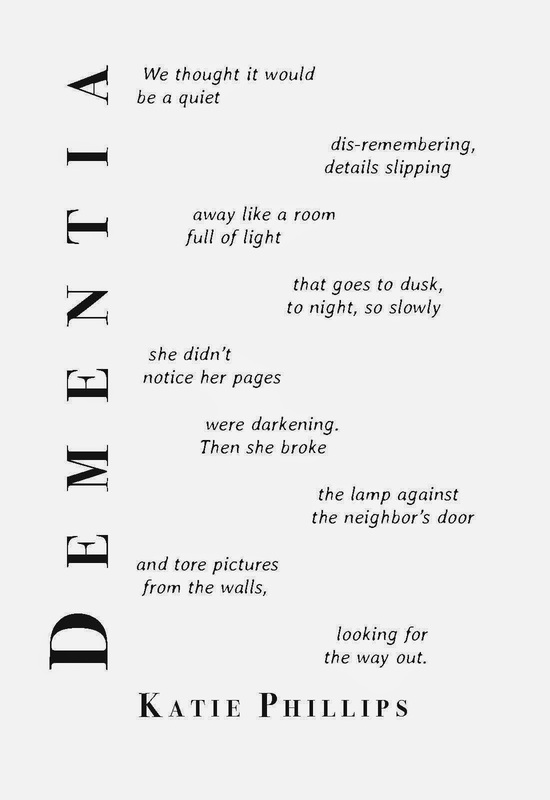 Click on the image to read the full text of the poem, or purchase it here. 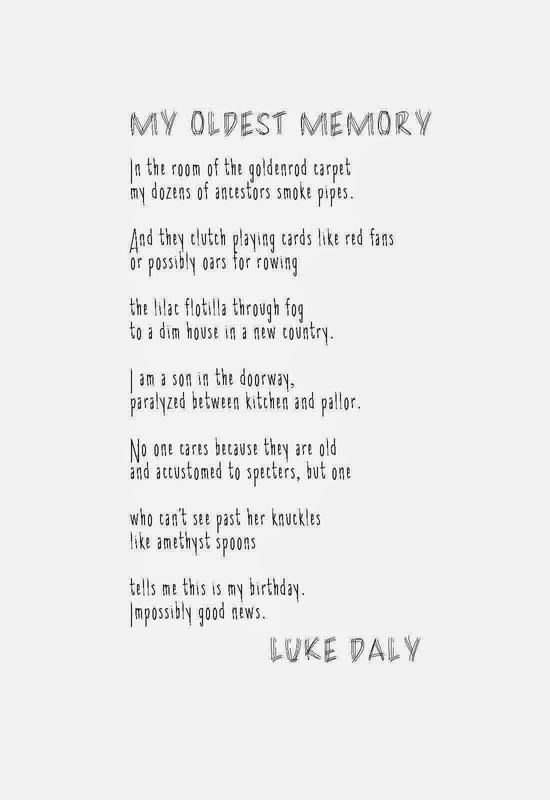 Luke Daly lives on the west side of Buffalo, NY with his artist wife and two daughters, and he teaches writing and literature at Villa Maria College of Buffalo. His poetry and criticism appear in Basalt, the Blue Earth Review, Comstock Review, The Corresponder(Mankato, MN), and the Cream City Review. 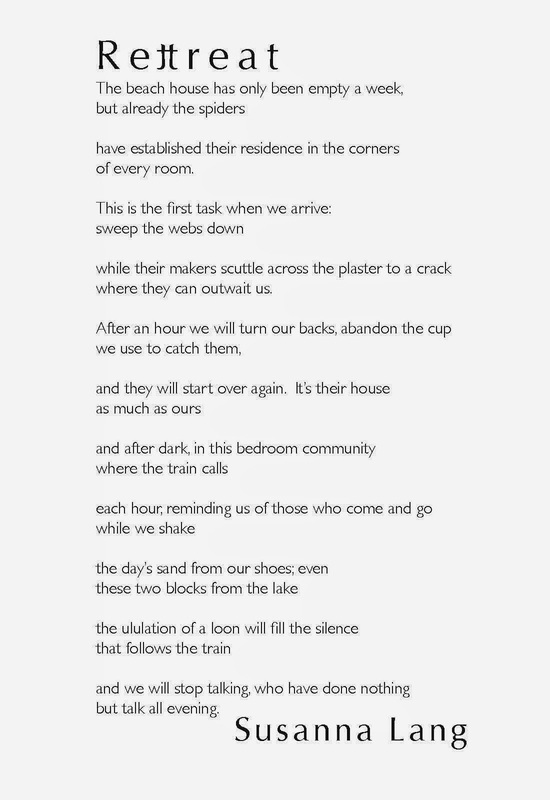 If you’d like to view more of his work, visit:http://www.creamcityreview.org/category/poetry/. This poem is haunted. Sure, the title calls it a memory but the line between the living and the dead has blurred to a fog of pipe smoke. Curious how the room is filled with “ancestors” instead of family, how their “flotilla” rows “to a dim house in a new country” as if crossing the River Lethe. All of this before the speaker calls himself a specter, “paralyzed” in a doorway. Maybe the line between death and life isn’t the pipe smoke. Maybe the line is that doorway and he is visible to the “one/ who can’t see past her knuckles” because neither are alive. Maybe this is the speaker’s day of birth. Maybe it’s just an odd memory dominated by a bright carpet and elderly relatives. Happily it’s a poem, so it can be both. Skinny Chick and Filament are each spectral in their own way, legibly ghostlike, caught “between kitchen and pallor.” For Skinny Chick it’s those extra long descenders and ascenders plus the slightly uneven baseline that give it the anxious feel of a child’s handwriting. Filament is that same child grown up, blocking capitals with several parallel strokes, trying to etch something tenuous into a more solid state. Together they look ad hoc, slight, ephemeral. Journals publishing Janet McCann’s poems includeKansas Quarterly, Parnassus, Nimrod, Sou’wester, New York Quarterly, Tendril, Poetry Australia, etc.. She has won five chapbook contests, sponsored by Pudding Publications, Chimera Connections, Franciscan University Press, Plan B Press, and Sacramento Poetry Center. A 1989 NEA Creative Writing Fellowship winner, she has taught at Texas A & M University since 1969. Her most recent poetry collection: The Crone at the Cathedral (Lamar University Press, 2013). So often Lilith is depicted as mad in one sense or another, so much so that the first line of this poem feels like a feint. Could she really be at peace with her life? Won’t the rest of the poem give the lie to her claim? 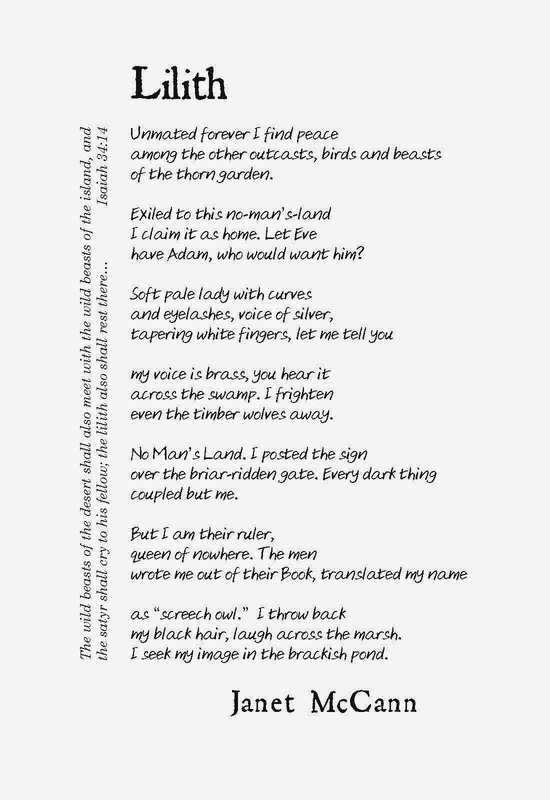 How refreshing, then, to find this Lilith does actually “rest there” (from the quotation from Isaiah) in her self-proclaimed “No Man’s Land.” Even as she addresses Eve, the woman who replaced her in Adam’s life, she makes no threats, insists only on being heard. She knows she is frightening, too, but doesn’t seek to inspire terror, only her own “image in the brackish pond.” The poem then, gives the lie to the idea that a woman who desires solitude must be mad. There are two stories here: the official, codified one from the Bible and Lilith’s own, personal statement in response. The two typefaces had to reflect those different sources and yet complement each other visually. The passage from Isaiah is represented in Century Schoolbook, the most traditional of the three faces used. It’s regular italic echoes the motion of Aji Hand, which approximates a quick scrawl. Roman Antique’s straight lines and grainy edges lie somewhere between the two styles, uniting them further. Katie Phillips grew up in Maryland & Colorado and lived in Montana before moving to the Chicago suburbs, where she now enjoys walking her Alaskan Malamute to her job at a local non-profit organization. Katie’s chapbook "Driving Montana, Alone" was published in 2010 and the title poem was later read by Garrison Keillor on NPR's The Writers' Almanac.Since then, she has continued to write and travel around the country studying with various poets. She can be reached at DrivingMontanaAlone@gmail.comor through www.facebook.com/katie7phillips.